With winter officially behind us and the days slowly but surely warming up, it’s time to stop hibernating inside and get outdoors. If you’re like us at Outside Concepts, that means reclaiming your Brisbane outdoor living area to enjoy some fresh air while relaxing and entertaining. Does your outdoor structure need a bit of tender loving care? Perhaps the decking timber could be replaced or a section of the roof repaired. Get them done now and you’ll be admiring your handy-work in the months ahead. For most Australians, enjoying outdoor living is about food, drink and a place to sit down. So if your BBQ or existing outdoor furniture needs updating or, at the very least, a good clean, get it done now. 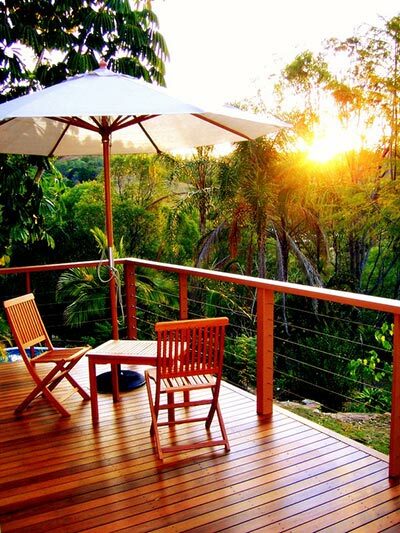 If you have a timber deck and/or timber furniture, re-oiling it can make it look like new again. More importantly, it will protect your deck and furniture from the elements for the months ahead. While summer is also a great time to enjoy outdoor living, the harsh summer sun can soon send you indoors. Café blinds are the answer and can also help with rain, wind and insects. Take a closer look at your surrounding garden. Replace dead or dying plants, give the garden a weed, top up the mulch and plant some annuals, and your outdoor living area will be an even more inviting area to relax and entertain. Also consider adding some nice pot plants to your Brisbane outdoor living area. They do take a bit of care, but will reward you with stunning displays. For some peace and tranquillity, consider adding a water feature. Even if you’re struggling for space, a small table feature can do the trick.